Shabdaguchha celebrated its 15th anniversary with a 3-day International Poetry Festival, the news of which is published in this issue in Bengali. Poets from at least 12 different languages gathered in three different venues last summer to mark the milestone of the magazine. We are grateful to Poets House, the Queens Library, and Casa Barkan for hosting the events. It was quite a good experience for all of us. The moments of the events will be with us forever, and we hope to bring more events like this for our poets in future. Among the many achievements of the events, the joyful smile on Stanley H. Barkan’s face after receiving the Shabdaguchha Lifetime Achievement Award was remarkable. This year, Sambhu Rakshit, a poet from West Bengal, India, received the 7th biannual Shabdaguchha Poetry Award. Mr. Rakshit lives in a remote village, Brinchiberia, where he has been editing a poetry journal, Mahaprithivi (The Universe) for more than 42 years. His book, Lament for a Beloved Voice was published in 1973, two years after the liberation of Bangladesh. The tone and voice in his poetry depicting human existence within the galactic reality of the universe is unprecedented. Surprisingly, none of the so-called giant national literary institutes came forward to congratulate this extraordinary achievement of the poet. Shabdaguchha is thrilled to acknowledge him with long overdue honor and recognition. 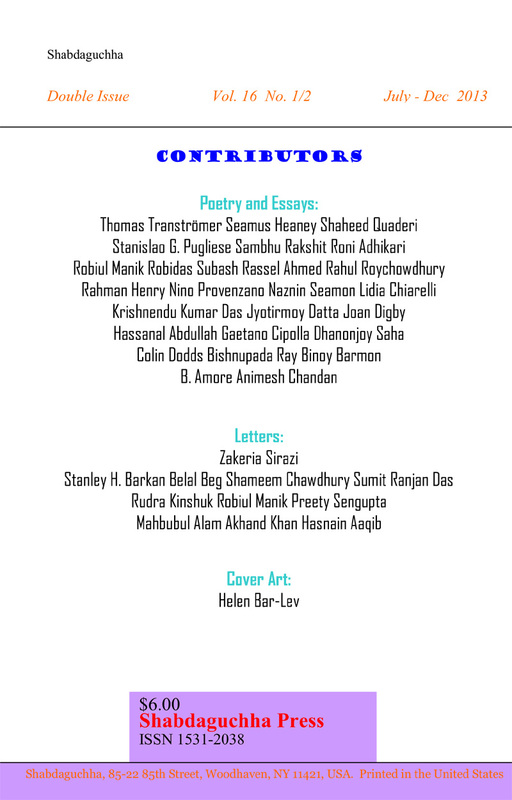 Poet Jyotormoy Datta, a well-known poet and essayist, translated two of Sambhu Rakshit’s poems for our readers which are published in this issue bilingually. As we are stepping into the 16th year of publication, we know that our responsibility to reach to the poets of the world is getting wide spread. And so to fulfill the demand, we presented Seamus Heaney and Thomas Tranströmer from English to Bengali translation, and Nino Provenzano from Sicilian to English, as well as many more poets in original Bengali and English for our readers.